Keirsten Howell (left) shadowed Principal Bray Shamblin (right) for a day to gain a fresh perspective on school administration. MERCERVILLE — South Gallia students and staff recently saw how their school operates from a different perspective. 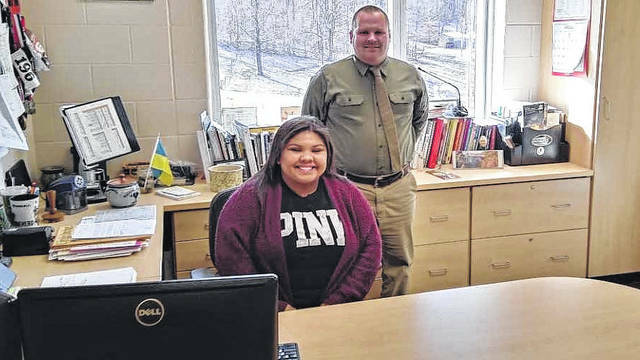 Each week a name is randomly selected and that person gets to shadow Principal Bray Shamblin for a day learning how the administration works. Keristen Howell, a senior at South Gallia, was fortunate enough to have her name drawn last Friday, so Thursday she spent the day not in her classes but following Shamblin and assisting him with his work. On the docket for the day included some of the regular items of a principal, patrolling the hallway and sending students to class. It also included making a special announcement that few students would get to do so. South Gallia had the highest attendance in the county school district, and as a reward they will travel to Dayton, Ohio to visit the United States Air Force Museum. Howell had the honor of revealing that to the student body. To be selected for the program, students had to drop their name on a slip in a box in the front office from which it could be chosen. Last Friday Keirsten was hopeful it would be her name. Howell also had the chance to make a new rule for the day, which she used to her advantage. “We’re going to let the kids go early to lunch ten minutes, but seniors get to go first,” stated Howell. Not only is Howell getting to make an impact for the day, she also is using her time shadowing Shamblin to implement a new program during lunch. During the lunch period many students sit around with not much to do, Howell wanted to change that. Howell suggested a trivia game that everyone could get involved in. “She wanted to add something fun at lunch, instead of just sitting around, we can throw it up on the projector and play a game one day a week to see if we can boost moral and camaraderie. It was Keirstin’s idea,” said Shamblin. The principal for a day program is a part of the 20/20 vision plan the administration has been working through. Staff also got to participate in the program, for similar reasons to the students. According to Shamblin the program gives students and staff a new perspective on how the office works, and provides the office with feedback and insight from those they work to support. Teachers often have to discipline students by sending them to the office, but they don’t get the chance to see how the administration deals with that child. That insight and background can better enable teachers to work with students struggling with personal difficulties they might not otherwise be aware of. The program will continue weekly throughout the school year, drawing one student a week. Administration will examine the program and consider it for next year as well.